The Monkees TV show debuted almost 50 years ago, on September 12, 1966. While some of the show’s antics may appear pretty tame by today’s standards, at the time, it was a groundbreaker. Created to capitalize on Beatlemania by creating an American version of the Fab Four, on The Monkees, a group of four strangers somehow managed to have instant, off-the-wall chemistry, making it an immediate hit and eventual Emmy winner for Best Comedy Series. It helped that in 1966, the show’s creators were ahead of the cultural curve. The Monkees debuted a year before The Summer Of Love, but the hippie counterculture aesthetic was already in play. Producers Bob Rafelson and Bert Schneider (who created their own production company, RayBert) would eventually take their Monkees money to fund not only the confusing Monkee movie, Head, but also Easy Rider and Five Easy Pieces, films that wound up defining that era’s youth rebellion. But before Jack Nicholson ordered a chicken-salad sandwich with no chicken and Peter Fonda climbed onto a motorcycle, there was The Monkees. It offered American youth a show of their own, something that their parents didn’t like and couldn’t understand. In 1966, The Monkees was the first TV show that had only young people in the lead, with no “adult” figure in sight (no parent, no manager). When the show premiered, musicians Mike Nesmith and Peter Tork were in their early 20s (both were born in 1942); actors Micky Dolenz and Davy Jones were 21 and 20, respectively. It was also unusual that the four didn’t have any character names but essentially played themselves: Mike the older leader, Davy the heartthrob, Micky the wacky cutup, and Peter the childlike innocent. They lived alone in a grubby but charming beach house (complete with needlepoint sampler that stated, “Money Is The Root Of All Evil”). The fourth wall was broken repeatedly, with Micky walking off set to visit the writers’ room or Davy stopping midscene to ask to take a line over again. 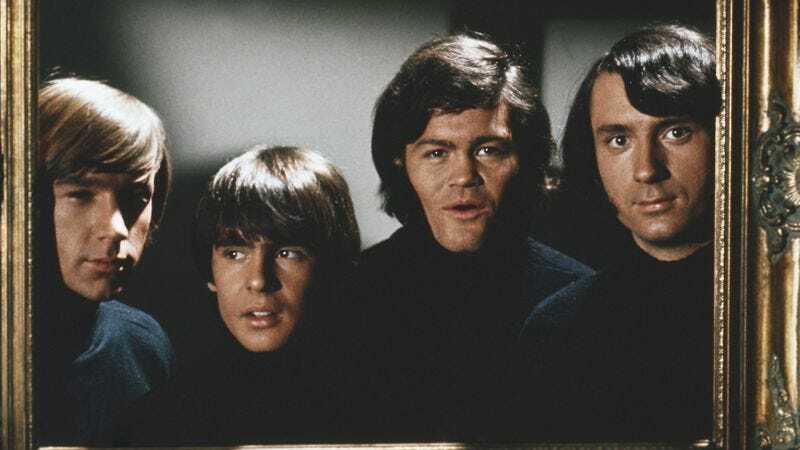 The Monkees won over youth culture with its four charismatic players in a series of subversive yet charming half hours. Most of the drama stemmed from familiar tropes (the monster movie, the gangster movie, the spy movie) while making fun of those tropes to the point of absurdity. The four young men, absolute strangers, had skyrocketing chemistry “instantly,” Dolenz reported to CBS recently: “It was scary.” The show’s excellent music—each episode usually featured at least two songs—didn’t hurt either, as The Monkees had the distinction of conquering the music charts and the TV ratings at the same time. The songs were backed by what the show creators called “Monkee romps,” early versions of music videos. Not coincidentally, a few years later, Nesmith would take the fortune his mother left him (she invented Liquid Paper) to help kick off the music-video industry, becoming the first person to win a Grammy for Best Video. The show featured other future film writers and actors like Paul Mazursky, and TV staples like Rose Marie and Bobby Sherman. But in such volatile times, The Monkees was only destined to last a few seasons. By year two, the boys were burned out from a grueling schedule, which included filming, recording, and touring. After they protested, the laugh track was deleted in season two, which somehow made their Stooges/Marx Brothers slapstick all the more surreal. The cast then added their own segments: Jones brought his friend Charlie Smalls on to talk about soul music. Nesmith had Frank Zappa appear to show everyone how to “play a car.” The show’s very last scene is Tim Buckley (Jeff’s dad) singing “Song To The Siren,” which was later covered by The Cocteau Twins. The preceding episode, written and directed by Dolenz, has the band saving the world from being hypnotized by television, one last raspberry blown at the very medium that made The Monkees famous. In honor of the 50th anniversary of The Monkees and The Monkees, here are 10 typical episodes that highlight what the show did best. There’s never been another series like it, before or since: It combined pop music and a fourth-wall aesthetic to capture a crucial sliver of time for a particular generation of young people. Davy falling in love (and girls falling in love with him) was a go-to for the show from its very first episode, highlighting the band’s ostensibly cutest member to turn him into an immediate heartthrob. Here his new relationship causes school problems for his girlfriend, so The Monkees get extra wacky to help her pass her history final. That’s about as complicated as a Monkees plot ever got, so in the meantime there are fourth-wall cutaways as a girl dances in the crowd (“An average teenager? No, a friend of the producers!”) and inspired setups like Mike offering a declaration of war to get a polka band to relinquish the stage. Take a look at all the fantastical asides: The Monkees are caught sneaking into a country club and immediately transform into escaped convicts in striped suits. This kind of fantasy may be standard nowadays in shows like Scrubs and The Real O’Neals. In 1966, such a shot was revolutionary and may help to explain those Emmys for best comedy and directing. Like Abbott & Costello and The Three Stooges before them, The Monkees frequently went to the horror-movie well for laughs, double takes, and freak-outs. In this episode, notably featuring Richard “Jaws” Kiel as the titular monster, a mad scientist tries to transfer The Monkees’ musical ability into the “android” (Kiel). The “Monkee romp” appropriately features “Your Auntie Grizelda,” an Eastern-flavored creepy song with a rare Peter lead vocal. Probably the best-ever episode of the series. The Monkees get drafted to appear on a kids’ TV show (Micky: “Welcome to the wonderful world of television.” Peter: “It doesn’t look like a vast wasteland,” a reference to Newton Minow’s famous diss.). In one fell swoop of an episode, The Monkees get to poke fun of the TV landscape they were in, offer send-ups of various genres (at one point they all pose as newscasters), while going meta on their own reception in the mainstream media (the TV station receives letters complaining about them as “long-haired weirdos”). The Monkee romp even contains a delightful segment of them getting chased by a bunch of kids, finally adversaries as childish as they were. All The Monkees were great, especially together. But standout Micky got the chance to step out in this episode, even more so because Davy was out of town at his sister’s wedding. Dolenz plays a double role here as Micky and BabyFace Morales, a gangster who looks just like him. Micky has to impersonate BabyFace to help the rest of his gang get nabbed by the cops. It’s a fun, more straight-ahead plot-driven episode and shows what the series was like without all four Monkees in full force. In this inspired romp, The Monkees get cast as extras on I Married A Creature From Out Of Town, starring actual teen idol Bobby Sherman as fake teen idol Frankie Catalina. After the star disses Mike’s green “bonnet,” the guys fight back in a series of inspired pranks but eventually wind up with a puffed-up Davy who’s as bad as the star they just defeated. The movie set gives the band lots of opportunity to play up their antics, while reminding Catalina, and the world, that no one gets the better of The Monkees. The Monkees ended season one with a video version of Tiger Beat magazine. Plagued by questions about whether or not they played their instruments on the show and in the band (they didn’t at first), the success of their first two albums in 1966-67 necessitated a tour, so Micky crammed on drums, and Peter and Mike got up to speed on guitar. It didn’t matter much, because the crowds screamed so loud, Beatlemania-style, you could hardly hear the music anyway. But this documentary episode offered fans a chance to see if The Monkees were really like their onscreen personas (they were). It’s a bit nonsensical, as Davy gets into a fight with a swan, Micky leads a bunch of kids around on roller skates, Mike checks out a sporting-goods store, and Peter shows that he actually was quite adept on the banjo. Then The Monkees invade a radio station, calling out bands like The Lovin’ Spoonful and The Rolling Stones, until Mike adds, “But most of all, we’d like to thank The Beatles for starting it all up for us.” The show tried to recreate the doc feel with the season-two clunker “The Monkees In Paris,” where the boys leave the set to get chased by girls for 25 minutes in The City Of Lights. The Monkees received its only season-two Emmy nomination for this episode, which uses fantasy to tell a straightforward story of what music means to the band. Peter inadvertently sells his soul to “Mr. Zero” in exchange for a harp that he instantly falls in love with. He then has to fight for his soul in a courtroom trial, where Mike sells a satanic jury on the power of love. As bizarre as that sounds, it’s as moving as The Monkees ever got, only aided by bits where they make fun of the fact that they can’t even say “hell” on TV, even though that’s where Peter’s about to be damned to. There’s also a fun video to “Salesman,” which resembles The Beatles’ “Taxman,” with the boys in appropriate Hades surroundings dancing in devil suits with female demons. Things were winding down around the end of season two, but this late effort shows that there was still some life in the show. This episode highlights the considerable charms of Davy, embarking on his last-ever starry-eyed romance. The band enters yet another rock contest, but all the groups have to be mixed. So Davy dresses like a girl and falls for a girl dressed like a boy in another group. As silly as it is, this episode shows that The Monkees really didn’t need the laugh track, and the show fared much better without it. It’s also worth it for the finale, as Davy was never Davy-ier than when grooving to “She Hangs Out” surrounded by go-go dancers. The writing was on the wall by the end of The Monkees’ second season, as the show got cancelled in June 1968. The series officially ended with this Dolenz-led effort. The title is made up of syllables from his family members’ names: Micky, Janelle, Coco, and George. The nonsensical plot involves a none-too-subtle look at television, as everyone is hypnotized by an evil eye on their TV screen. Peter is zombified, and everyone else is so over it that they make fun of their Monkeemen personas, take lines over, and frequently reference their own show. By this point, The Monkees were already getting psychedelic in their music, but their final episode shows them doing it on screen, paving the way for the unintelligible mania that would become Head. Stick around for that final Tim Buckley moment, which closed the curtain on The Monkees forever—at least until a 1986 MTV rerun marathon made Monkeemania start up all over again.